Periodontal Maintenance in Mission Viejo | Orange County Periodontists | Ajay B. Setya, DDS, MSD Robert C. Hirst, DDS, MS Christen S. Bergman, DDS., MS.
We help you maintain your oral health after treatment with thorough cleanings and home oral care education. Once your treatment is completed, our hygienists will ensure your oral health is maintained with thorough routine cleanings and home oral care education. Gum disease can return easily after treatment if follow-up oral care is inadequate. Gum disease can only be prevented for the future by continuous removal of the bacteria that accumulates on the teeth so as to prevent the build-up of plaque and calculus that generates the infection. The doctor establish your hygiene maintenance schedule according to your individual needs and will brief your hygienist on any concerns that may need special attention during your appointments. Our hygienists are highly trained with decades of experience. They have also been given special training in advanced techniques and patient care from Dr. Setya, and act as his training assistants in local technical seminars he gives for other hygienists. 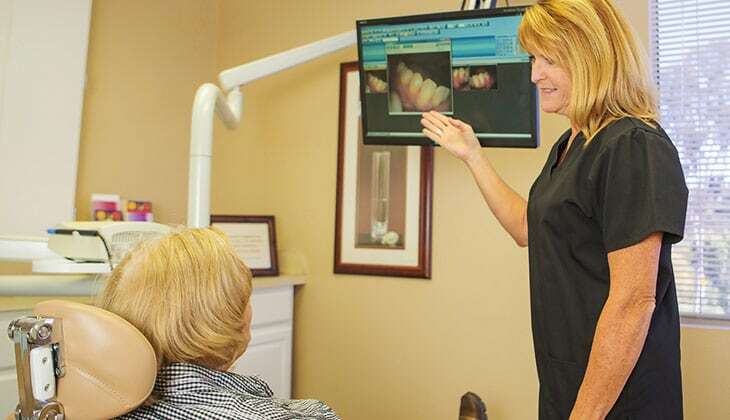 Our hygienists use high-tech tools to closely track the state of your oral health and provide gentle and thorough cleanings. They also provide comprehensive home oral care education so you are able to effectively maintain your oral health with proper techniques. We use special dyes to track the removal of plaque from your teeth. At the beginning of your hygiene appointment, our hygienist will have you chew a tablet which contains a purple dye that stains the plaque on your teeth. In this way she can see how much new bacteria has accumulated on your teeth since your last cleaning. Plaque that has only recently formed on the teeth and plaque that has been present for a long time will show up as two different shades of purple. From the results she will come up with a “plaque score,” and will take a photo of your dyed teeth so you can view the results with her. As needed, the hygienist will recommend changes in your home oral care routines to more effectively eliminate the bacteria and prevent future build-up. She will also explain the relationship between gum disease and other health problems in the body. Our hygienists use ultrasonic scalers for gentle and effective cleaning. Our hygienists use ultrasonic scalers to quickly and gently remove the plaque and calculus that has accumulated on your teeth and below your gum line. Ultrasonic scalers use high-frequency vibrations that clean deeper and faster than traditional scaling instruments. The vibrations can also be adjusted for strength so your cleaning can be done at a comfortable pace. They use special titanium or plastic micro-instruments to safely and effectively clean dental implants and the surfaces surrounding them. Scratched surfaces on an implant can accumulate bacteria and cause infection, and our instruments effectively clean without damage to the implant surfaces. We thoroughly educate you on proper home oral care. Our hygienists make home oral care education a major part of your maintenance care. In addition to regular cleanings, adequate home oral care is a must to keep gum disease effectively at bay. They will advise you on the best oral care products to take care of your specific needs, and will show you the best brushing and flossing techniques using digital illustrations, models, drawings and demonstrations. Our hygienists also educate you on the connection between gum disease and health problems in other parts of the body so you understand how adequate home oral care can prevent or reduce difficulties in other areas. You may request a special appointment with one of our hygienists for comprehensive training in brushing and effective flossing techniques and where needed, training in the care of dental implants. This will include training in the use of any recommended special home care devices. The hygienist will demonstrate these methods in detail and will have you practice along with her. She will answer any questions you have so you are confident in applying what you have been taught. To make an appointment, call 949-482-6089 or click here to request an appointment online.